NACA’s 29th Governing Council Meeting was held in the Maldives capital, Malé, from 26-27 June, with attendance by fifteen member governments, the Regional Lead Centres for China, India, Iran and Thailand, the Food and Agriculture Organization of the United Nations (FAO) and the Southeast Asian Fisheries Development Center (SEAFDEC). The incoming Chair, Dr Shakeel Hassan, Senior Biologist for the Marine Research Centre, Ministry of Fisheries and Agriculture, welcomed participants to the Maldives. The outgoing Chair, Dr Md. Goljar Hossain, Director General of the Department of Fisheries, Bangladesh, made introductory remarks. China was elected as Vice Chair for the meeting. The meeting was opened by Dr Mohamed Shiham Adam, Maldives. The Director General of NACA, Dr Cherdsak Virapat, presented a gift to the Government of the Maldives, which was received by the Hon. Shah Ismail, Deputy Minister. The Hon. Adam Haleem, Deputy Minister, presented delegates and partner organisations with a souvenir. 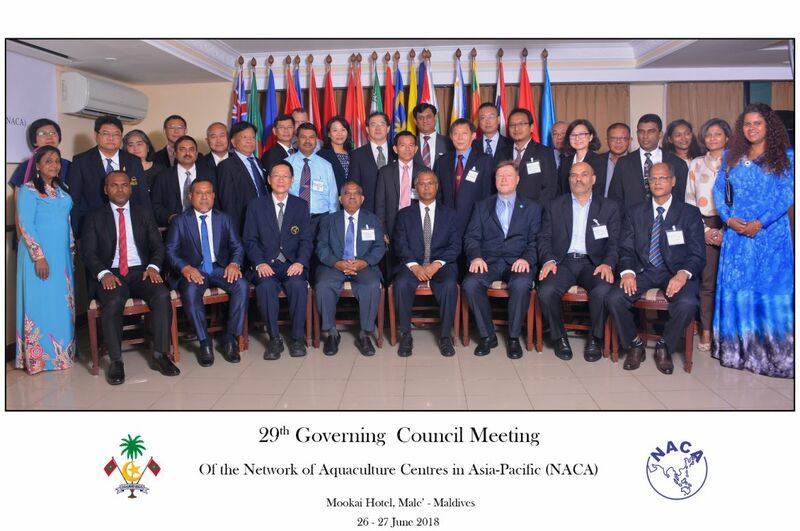 This was the first official NACA meeting in the Maldives, since it became a member in 2014, and also the first time that most of the delegates had visited the country, affording participants a fascinating glimpse of a very different lifestyle in the archipelago, and a very different development context. Members discussed priority issues for the year ahead and opportunities to collaborate. As always, animal health issues continue to be a challenge, but the usage of anti-microbial substances in aquaculture and the consequent development of anti-microbial resistance were considered to be an issue of great concern, given the potential impacts on human health. Many members are currently taking stock of practices in the aquaculture sector and ramping up awareness campaigns to encourage responsible usage of chemicals and alternatives such as better management practices, aimed at improving the health status of animals and reducing risk of disease naturally. This work is happening as part of a coordinated effort across all livestock sectors and the human health system as well. Aquatic genetic resources were also a hot issue. There is increasing awareness of the need to improve management of genetic resources. There are massive unrealised gains to be had through the development of genetically improved varieties with superior production characteristics, or even through simply avoiding inbreeding depression. The conservation of wild aquatic genetic resources is also gaining attention, with increasing awareness of the potential impacts of stock enhancement programmes, particularly on threatened species. FAO informed the meeting that the first global report State of the World’s Aquatic Genetic Resources for Food and Agriculture is being readied for publication, based on reports from 92 governments that collectively represent around 96% of global aquaculture production. There was widespread support for continuing work on the development of culture-based fisheries; prior work undertaken years ago in Lao PDR under Prof. Sena De Silva’s initiative continues to spread organically as neighbouring villages take up the practice after observing the benefits. Members have also made substantial progress in revising legal frameworks governing aquaculture, notably in Thailand, to improve the basis for regulating the industry. There was renewed interest in strengthening cooperation in mariculture development, with the Maldives offering considerable opportunity for exchange. A key recommendation from the meeting was to investigate the possibility of convening a global “Aquaculture +20” conference to take stock of the sector, building on the previous series of development-oriented conferences beginning with the “Kyoto conference” in 1976, the “Millennium conference” held in Bangkok, 2000, and the “Aquaculture 2010” conference held in Phuket. On behalf of the members, NACA wishes to thank the Government of Maldives and the staff of the Marine Research Centre and Ministry of Fisheries and Agriculture for their kind assistance in organising the meeting and excellent hospitality and hosting arrangements.